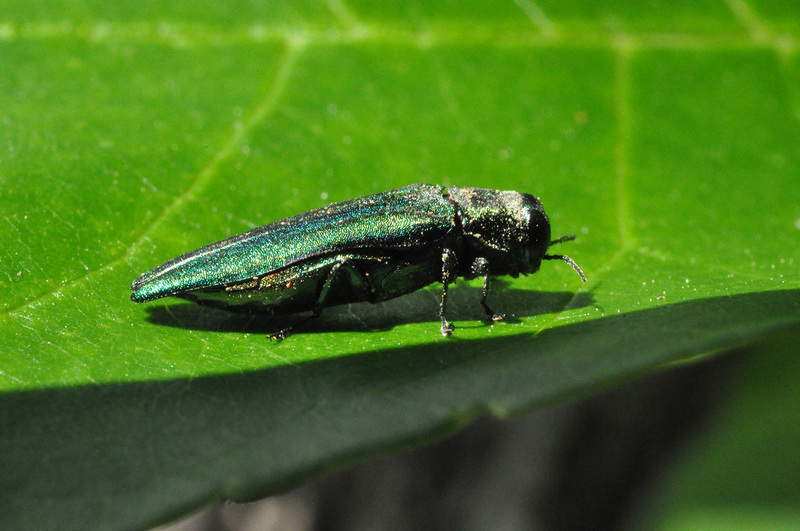 An emerald ash borer (EAB) adult was captured in a trap near Cumberland, KY; this is the first record from Harlan County in eastern Kentucky. Adults (Figure 1), which live from 3 to 6 weeks, can be active from late May through August. During that time, they feed on ash foliage, mate, and females lay eggs in cracks and crevices on the outer bark of ash trees. Local spread occurs as the beetles disperse. Wind tunnel research determined an average flight distance of 1.8 miles for mated females. During the experiments, 20% flew just over 6 miles and 1% flew 12 miles. Eggs hatch in about 2 weeks and small larvae immediately chew into the tree phloem to feed. Most feeding and growth occurs from August through October. Their galleries interrupt the flow of nutrients and water in infested trees.